De Vylder Vinck Taillieu: De Vylder Vinck Taillieu slowly expands on a body of work that celebrates an unfinished aesthetic. Atelier Vens Vanbelle: Aluminium panels reflect natural light, allowing it to penetrate deep into the courtyard of Vens Vanbelle’s apartment complex in Ghent. Puls Architecten: Puls Architecten builds houses on difficult and often unwanted urban plots. 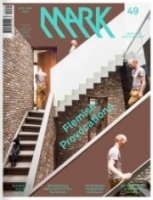 Blaf Architects: Blaf challenges Belgian building conventions. De Smet Vermeulen: De Smet Vermeulen swaddles its clients in domestic bliss. Graux & Baeyens: Graux & Baeyens divides a fermette into three copper-clad volumes. Iroje KHM in South Korea: Hyo Man Kim integrates spacious natural landscapes into the houses he designs. Studio Fuksas in Shenzhen: Massimiliano and Doriana Fuksas provided Shenzhen with a welcoming airport terminal clad in honeycomb. Büro Ole Scheeren | OMA in Singapore: The Interlace looks like a jumble of toppled towers. Housing development in Africa: Developers and construction companies from China are building Africa’s mass-housing stock. NAM in Tokyo: NAM is a Japanese art collective that specializes in designing daydreams. Johnston Marklee in Oxnard: Johnston Marklee captures light and views on a confined lot in Southern California. [Ay]A Studio in Paris: Jorge Ayala is an emerging designer who skips from landscape to furniture to fashion. Leap Factory in Mount Elbrus: Leap Factory’s latest mountain refuge in Russia withstands extreme weather conditions.